At RIOC's last Board Meeting, a kerfuffle over the big red RI Icon, the first of two, erupted when President/CEO Susan Rosenthal lobbed, "It's a done deal," back at historian Judy Berdy in answer to her protest. Who was right? Is Student Warehousing Destroying A Roosevelt Island Tradition? Just when you thought you'd seen the worst of Roosevelt Island's community disintegration, with large volumes of rentals converted to foreign student warehousing and quick turnaround (and completely illegal) Airbnb-style mini-hotels, more bad news arrives about heartless, downstream effects. After listening to readers who value the chance to participate in stories by commenting on them in the Disqus format, we've decided to open up the system again. But there are no guarantees. You may not have heard the term, but pivoting is an art politicians work to perfect. Watch any news show or, for a great example, a Sarah Huckabee Sanders press conference. A question is put forward, and a strategic answer pops out that responds authoritatively on something not asked. Pivoting is a dodge. With politicians, it's typical dishonesty. With a State agency trusted to serve residents' interests, it's also immoral. A couple of weeks ago, I published Main Street WIRE Didn't Want Me, So Why Do They Keep Following Me Around? My fervent hope was that they'd go get their own ideas or, failing that, give me credit for the things that now make up most of what the "independent" newspaper does. While waiting to see if they copy me again (Of course, they did. ), I recalled an earlier incident and decided to follow up on what I'm calling the Briana Warsing Bypass. Why Have Hudson and RIOC Teamed Up To Snub Main Street Retail? The worst kept secret on Roosevelt Island is that we have lots of location signage, good stuff too, easy to follow and right where visitors need it to be. The best kept is why it never benefits the struggling Main Street retail corridor. 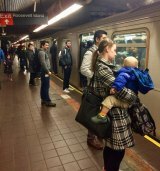 If you advertise in the Main Street WIRE, your money's invested in a campaign of misinformation intended to drive a Roosevelt Island institution out of business. Is that what you intended to buy? 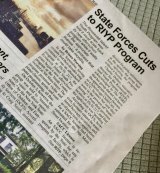 Late last week, in the grand, local tradition of "Kick 'em When They're Down," Main Street WIRE Editor/Publisher Briana Warsing clubbed the Roosevelt Island Youth Program in a brutal attack, inspired by friends of PS/IS 217 Principal Mandana Beckman, hoping to bury RIYP, a group that's helped kids here for more than 40 years. On Friday, Warsing was forced to back down. But it was reluctant, partial and in another WIRE tradition woefully inaccurate.